Featuring the NEW Rugged Radios' RM-25R 25-Watt Dual Band Mobile Radio, this kit is the perfect setup for any base camp or chase vehicle operations! This small radio is half the physical size of a traditional 50 watt radio making it easy to find somewhere to mount it into your Bronco. The RM-25R radio is also extremely efficient when it comes to power consumption using the included 12 volt cigarette lighter power adapter. Rugged Radios has also integrated the 5-pin radio cable right into the back of the radio which means no additional radio jumper is required when connecting to an intercom or harness. 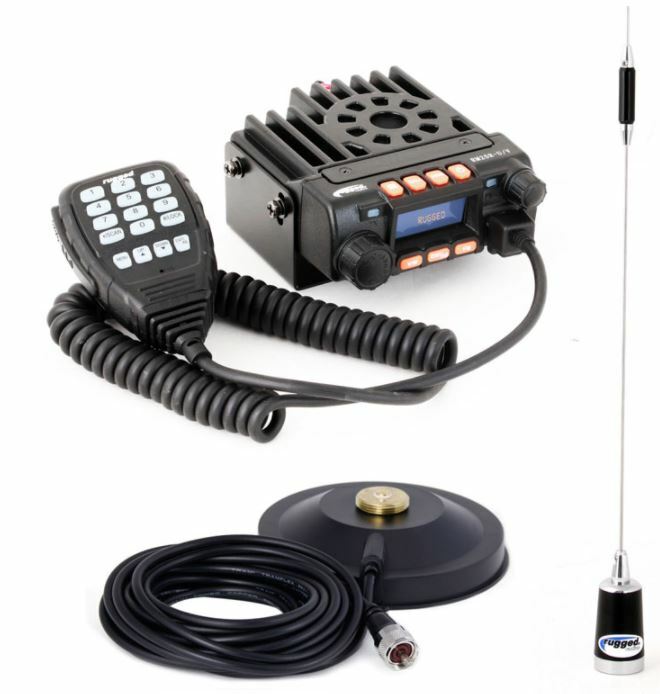 In addition to their most popular radio, this kit includes a dual band 1/2 wave antenna to maximize performance as well as a coax cable with magnetic mount to easily mount your antenna to your vehicle. Reaching distances up to 12 miles, this kit will allow you to keep in touch with your entire team!